Perhaps when the words meant something, Blinky Palermo was the very embodiment of the “avant-garde.” He had that honest immediacy about what was great before him and possessed the intuitively intentional shift in perspective that honored its essence but questioned its pretensions. 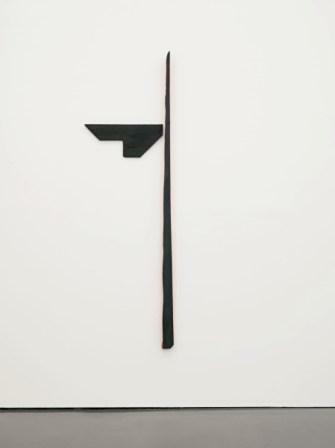 Blinky Palermo, aka Peter Schwarze, aka Peter Heisterkamp, in his short-lived but vividly impressive career in the ’60s and ’70s, would turn the doyen Clement Greenberg’s American abstract expressionism modernist theory of flatness on its head. He fearlessly broached modern art’s ambivalence about decoration. A confessed lover of America, Blinky would exuberantly bridge European objective sensibilities to the abstract self-expression ethos and invert the grandeur of scale to the postmodern minimalist’s humor; and all in a manner of roughly ten years. As for the back story of this young German, a student of the charismatic Joseph Beuys, LACMA has been patiently but passionately telling it through the dense, revelatory exhibitions on German art in the twentieth century, curated by Stephanie Barron. Starting with the three exhibitions Degenerate Art (1991), Exiles and Emigres (1997), and, most recently, Art of Two Germanys/Cold War Cultures (2009), Ms. Barron has made it possible not only to understand Palermo’s attraction, but how European art and American art could end up on the same page. The history lesson continued with the comprehensive overview of Joseph Beuys’ diverse and penetrating display of “Multiples.” Lynne Cooke, the curator of Blinky Palermo, accomplished a striking resolution to what happened next in the modernist or postmodernist journey. At the Kunstakademie Düsseldorf, under the tutelage of Joseph Beuys, the then Peter Heisterkamp would be tagged Blinky Palermo through a photo of Sonny Liston’s Mafioso manager by a fellow student. With almost punk rock star intensity, Palermo would question the nature of painting, its form, and its interplay with the very wall on which it is presented, finding in abstract expressionism’s exhibits something that remains ultimately a touchstone of his art—the inimitable “gesture.” The sense of artifice was paramount in Palermo’s work; were it not for his modern intent, one could surmise that he was a conjurer of symbols, though of course meaningless ones. In her book, Blinky Palermo: Abstraction of an Era, Christine Mehring traces judiciously Palermo’s cool modernity with its definitive expressive need for the gesture through his many references and configurations. But to actually enter the gallery on the second floor of BCAM full of Palermo’s earlier abstract art is its own revelation. If for no other reason than the sheer scale, one feels that one is at the beginning of something, a different vision. It is both regenerative and adventurous, primitive and sophisticated, but ultimately viscerally loaded. It is pure sensation. His almost esoteric geometric grammar defies its own logic with a mix of rough-hewn, somewhat archaic forms and anatomical references, yet it visually renders a rational pleasure. The painted staff, on close examination, is a giant splinter; the wrapped Blue Disk and Staff, the Butterfly 1, the Tagtraum l, untitled Totem, and Landscape are all in contrapuntal stress, metaphorically speaking. But the “gesture” is everywhere. 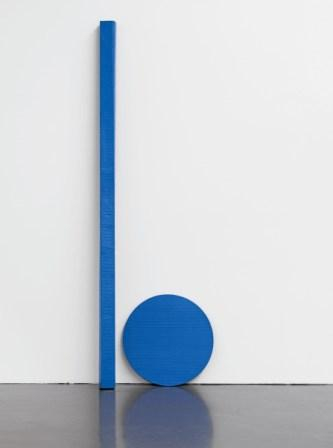 The Blue Triangle is nothing, by the way, like Ellsworth Kelly’s, nor that which figured saliently in Wassily Kandinsky’s theories of abstract art; though the triangle and the color blue animated Palermo’s art as an abiding intellectual haunting, as if testing its truthfulness. The notorious Wall Paintings, the famous Cloth Paintings that worked against the Greenberg dogma with its easy and humorous comment on decoration remain a fresh rebuttal. Palermo’s innate skepticism toward utopian concepts of art informed his passion for the fundamental elements of perception. This entry was posted on Tuesday, November 2nd, 2010 at 6:00 am and is filed under Uncategorized. You can follow any responses to this entry through the RSS 2.0 feed. You can leave a response, or trackback from your own site. One Response to Who is Blinky Palermo?